Is it time for a Korean stimulus? The IMF made an important statement last week, recommending that South Korea adopt expansionary fiscal policies. This means lowering taxes and/or increasing government expenditures to stimulate economic growth. The underlying principle is simple: if people have more money to spend and the government is spending more, the economy will have more money rolling around in it, supporting new jobs and expansion. Hence the name. The hidden phrase in expansionary policy is “public debt.” Virtually every industrialized country not named Greenland or Norway runs a government deficit at some point, meaning tax revenue is exceeded by expenses, requiring the government to borrow to cover the difference. This is called “public debt.” Expansionary policy, especially when carried out through tax reduction, means the government accrues more public debt than usual. To its credit, South Korea has one of the lower public debt rates among OECD countries: only 38 percent of annual GDP. For reference, the world and EU averages are 61 percent and 83 percent, respectively, with the United States, Canada, and Germany, respectively, having public debts of 105 percent, 90 percent, and 64 percent. This means South Korea is actually well-positioned to absorb new expansionary policies. South Korea’s low public debt is a legacy of the 1990s Asian financial crisis. During this period, the Korean economy collapsed through a combination of poor business practices and unsustainable debt. After a strong recovery in the 2000s, household debt has again started stacking up, reaching 97 percent of GDP by the end of last year, one of the highest rates in the world. For reference, the United States, Canada, and Germany, respectively, have household debt rates of 78 percent, 100 percent, and 53 percent. Public debt has remained under a tighter leash. The Moon administration has been especially careful, keeping the books balanced with fiscal surpluses and raising taxes to support new spending bills. Most of this new revenue has gone to pay for public sector job expansions. Despite the effort, South Korea’s overall unemployment has increased, sparking concerns over a cloudy economic future. 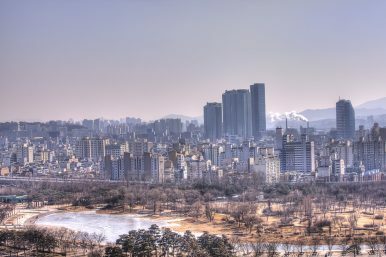 This uncertainty has brought Seoul to the point where government borrowing may be needed to prevent economic contraction. The usefulness of expansionary policies in the short term is not disputed. When there is more money in the system, jobs are created. Essentially, this money can be viewed as an investment to create new industries and business. The challenge in modern times is to make this investment sustainable so the government, at some point, can stop borrowing, with the new industries and businesses gaining enough footing to pay for themselves and, hopefully, generate tax revenue back to the government. Japan is the unfortunate example of a country that pursued expansionary policies too far. Saddled with public debt now worth 253 percent of GDP, Japan got here by pursuing a long series of expansionary policies (also called stimulus packages) over the course of several decades. The policies were well-intentioned, of course, aimed at improving growth by targeting a range of investments in technology, infrastructure, and education. Unfortunately, the investments never paid off, leaving the Japanese government in the awkward position of now being able to only pay interest on its debt. At the other end of the debt spectrum is austerity. This is the process in which a government cuts spending to reduce debt. In the last decade, a number of countries, most notably in Europe, have attempted this practice to disastrous effects. The basic notion of cutting spending to reduce debt seems like common sense at first. This is exactly what a household or a business would do. Unfortunately, national economies don’t behave like either. As mentioned above, money spent by the government creates jobs by adding cash to the economy. If that cash is removed, people lose their jobs. Brazil is a good example of how austerity can make bad things worse. In the early 2010s, Brazil, primarily an export economy, was experiencing slumping exports and mounting corporate debt. The former was having a very direct impact on economic development, bringing GDP growth to a standstill. The latter was making companies shy about investing as they focused on debt repayment, putting a halt to private sector hiring. Starting in 2014, Brazil’s then-President Dilma Rousseff implemented a series of austerity policies intended to curb both corporate and public debt. The policies were popular and seemed to make common sense, but were entirely misguided, plunging the country into the worst recession of its history. Unemployment skyrocketed from around 6 percent in 2014 to a high of almost 14 percent by 2017. The new policies also failed at their intended purpose: public debt ballooned from 56 percent of GDP in 2014 to 80 percent now. Brazil’s path, unfortunately, shares some striking similarities with South Korea’s current situation. South Korea, another export-dependent economy, has seen its exports declining in recent years with corporate debt increasing. The former has depressed growth while the latter has put a strain on private sector hiring, just like it did in Brazil. To avoid the same disastrous outcome, austerity must be avoided while expansionary policies, like those recommended by the IMF, seem a sensible option for stimulating continued growth. The remaining question, then, is how to spend the borrowed money. A tax reduction likely would be welcomed by the general public, perhaps even helping President Moon Jae-in’s flagging approval ratings. With interest rates at a modest 1.75 percent, extra money in people’s savings accounts would likely have some positive effect on domestic investment, although less than in previous decades as South Korean banks have recently turned to investing more overseas. If tax breaks are used to pay debt, this too would have little effect on growth, putting a limit on their effectiveness. The focus of any expansionary policies, therefore, will have to be targeted investments in specific industries. Moon has already identified hydrogen cars as a key area of interest, linking future exports with China’s continued commitment to renewable energy. Investing in other South Korean strengths such as electronics and chemicals also seem like sensible options. If Seoul follows through on IMF recommendations, the next few months should reveal a series of decisions about how the South Korean government will be betting on its future. Justin Fendos is a professor at Dongseo University in South Korea and the associate director of the Tan School at Fudan University in Shanghai.